There’s never any guesswork about correct dosing with over-the-counter (OTC) medicines because every OTC has clear dosing instructions right on its label. The OTC label, known as the Drug Facts label, has specific instructions for safe use and should always be followed precisely. These directions tell you what amount of medicine to take, how to take it, when to take it, and when not to take it. If a label does not list dosing amounts for the person taking the medicine, call a healthcare provider for advice on the best treatment options. Always keep your OTC medicines in the original packaging so that you have proper dosing information on hand. 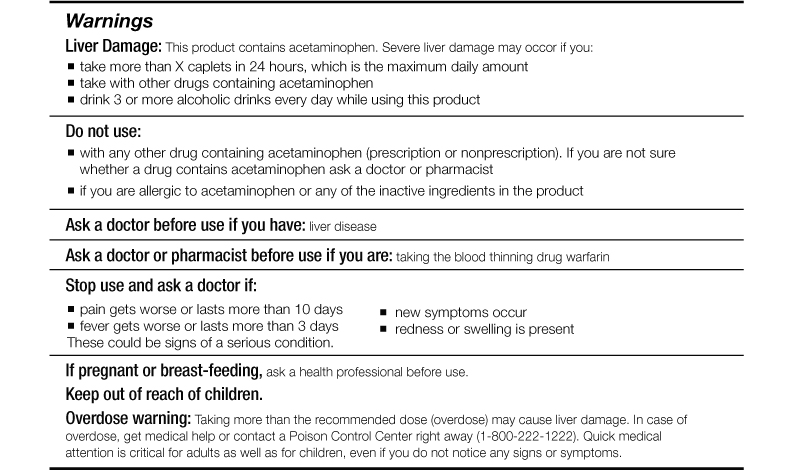 Scroll over the different sections below to learn more about the various sections on your OTC medicine label. This section lists the ingredient or ingredients that make the medicine work. For example, the active ingredient is what helps your fever go down, reduces your pain, or relieves your cough. It is especially important to pay attention to this section if you are taking more than one medicine—whether OTC or prescription—to make sure you are not taking too much of the same active ingredient. Too much of an active ingredient can be harmful. This section tells you what type—or category—of medicine it is, such as an acid reducer or antihistamine. This section tells you what symptoms or illnesses you can expect the medicine to treat. You should only use products that treat the symptoms you have. If you are using more than one medicine, pay specific attention to the active ingredients so you don’t accidentally take too much. There are times when you should not take a particular medicine. The warnings section explains these times, and also tells you when a healthcare provider needs to be consulted, as well as when to stop taking a product. The “warnings” section also lets you know if there might be side effects to a medicine and if you should be cautious during any particular activities, such as driving. This section also may tell pregnant and nursing women not to use certain products unless they’ve talked to their healthcare provider and reminds parents and other caregivers to keep medicine out of the reach of children. A medicine’s directions tell you exactly how and when to take a medicine. Remember, you should never take more than the Drug Facts label says, and you should never take a medicine more often or for longer than the label says unless told to do so by your healthcare provider. Taking more of a medicine or for longer than directed can be dangerous. Be very careful when giving medicine to children. Read and follow the age or weight instructions on the label and always use the correct measuring device when administering liquid medicines. If you have any questions, talk to your child’s healthcare provider. This section tells you other important information you should know about a medicine, such as where to store it. Take a look at the labels on the medicines you have in your house and make sure you are keeping them in the right place. Most medicines should be kept away from heat and humidity. And remember what you learned in the “warnings” section: Regardless of the medicine, always keep medicines out of the reach and sight of children. The inactive ingredients section includes important information, especially if you or a loved one has a known allergy. Always talk to your healthcare professional if you have any questions. You can also call the toll-free number listed in this section.